What’s in a name? The four Stowes. Portion of table of contents of 1918 San Diego County Brand Book showing the livestock brand registered to W. J. Stowe (misspelled Stone here). Courtesy of History Office, San Diego County Department of Parks and Recreation. “Los Angeles man buys ranch near Bernardo,” was the headline of an article in the San Diego Union of August 3, 1918. 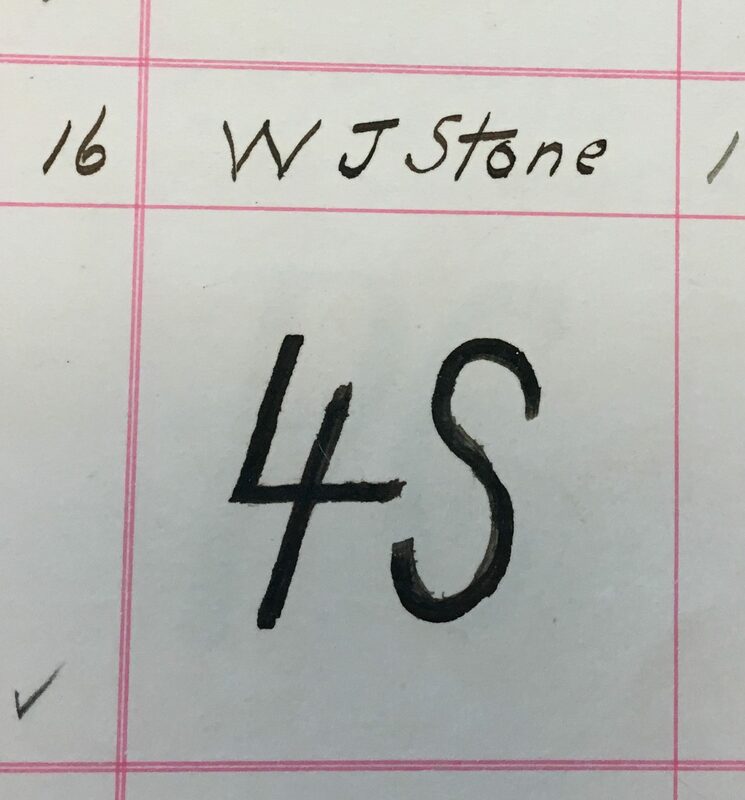 The brand he chose represented the four Stowe family members living on the ranch and helping to run it: William J. Stowe, his wife Ada (who was listed as the official purchaser) and his sons Perry and Gardner. William’s elderly mother and mother-in-law were also in the household, but not involved in running the ranch. The Stowe family would sell the ranch within a few years, but their “brand” remains on 4S Ranch to this day. I’m grateful to Ellen L. Sweet and Jennifer A Grahlman, intrepid history detectives at the History Office of the San Diego County Department of Parks and Recreation. They mentioned the origin of the 4S name in their recently published book, San Diego County Parks: Over 100 Years, The 1918 brand book is happily preserved in the History Office archives. Other sources for this post were the websites Genealogy Bank and Ancestry.com. One of my goals in researching and writing about history is to illuminate the lives of ordinary working people whose role in building and shaping our world can be overlooked. So I started out looking for one of those ordinary people for a blog post subject. And I tried one of my best sources: census data. I’ve pointed out in past posts what a wealth of info you can find in census records. In this particular case, I hit a brick wall. So far, I haven’t been able to find this particular person. But in looking for someone I thought might be a relative, but wasn’t, I stumbled across some more insights. When I first saw this page, the name of Mr. Morse sounded very familiar. He turned out to be a major figure in San Diego history. After coming west from his native Massachusetts during the Gold Rush, Morse moved from northern California to San Diego County in 1850. He made a name for himself as a retail merchant, banker, and realtor in the city of San Diego. From the 1860s to the end of his life he served at various times as a judge and a city and county treasurer. He also helped promote the coming of railroads and an early water project, the San Diego Flume Company. How do you manage 3,100 head of livestock on a hundred-acre ranch? With a lot of help, as shown by the other nine names listed below Smith and Morse on that farm household. First comes Daniel Hatfield, 35 years old, a native of New York State. Then there’s Alexander McLaughlin, also 35 and originally from Ireland. Following McLauglin comes another Irishman, 25-year-old Robert Caffel. Jose is 22 years old. Sources for this post included the 1860 United States Census, historic San Diego County newspapers and the book, History of San Diego: 1542-1908, by William E. Smythe.